Burdock root (Arctium lappa), a member of the daisy family, is thought by traditional healers to have detoxifying properties. 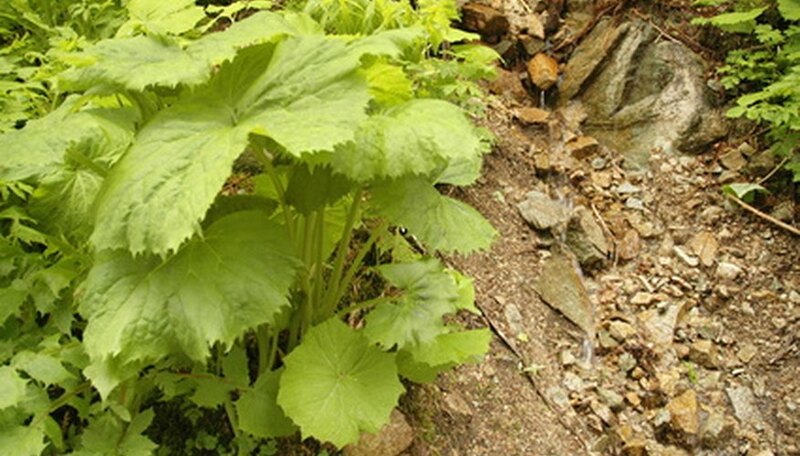 In Japan, burdock is grown and eaten for its nutritional value. In the United States, the plant is available in tea, tincture, capsule form and fresh root which can booked or brewed into tea While no scientific studies positively confirm its health properties, and overuse of the root can have dangerous side effects, you should confer with a health-care professional before you use it. However, as an herbal tonic for your garden, it's one of a number of herbs high in nutrients, vitamins, essential elements and antioxidants that can fortify your plants. Burdock is a hardy, common weed found in overgrown gardens, wooded areas and in driveway cracks. It's most recognizable by its heart-shaped leaves and spiny, purple flowers that bloom throughout the summer and become sticky burrs in the fall. A perennial, the plant can grow to heights of nine feet. While the leaves and seeds can be used in tea, the root, hard, wrinkly and grayish-black in color, is most potent when brewed in tea. Burdock consists primarily of carbohydrates, volatile oils, plant sterols, tannins, and fatty oils. Researchers aren't sure which active ingredients in burdock root are responsible for its healing properties, but the herb may have anti-inflammatory, antioxidant, and antibacterial effects. In terms its nutritional composition, burdock is rich in vitamin B complex, vitamin E, calcium, iron, magnesium, phosphorus, potassium and zinc — all essential to plant growth. In addition to the primary elements of nitrogen, phosphorus and potassium, plants thrive when gardening soil contains potassium, calcium, zinc and magnesium. While calcium is a building block for plant tissue and other metabolic processes, magnesium helps plants to produce chlorophyll. Just as compost tea provides nutrients directly to the soil and plant roots, liquid fertilizer improves soil conditions. In gardening herb concoctions, Herb Companion recommends making the tea with just one herb. As you cut back fresh burdock, save it in a bucket to be used in tea. Be sure to strain the tea; macerated burdock can be tilled into the soil as compost. The best time to apply the tea — either directly to the soil or sprayed on the leaves — is in the early evening, when temperatures are cooler and pores or "stoma" on the leaves are open. Soak burdock whole or chopped with the leaves, seeds and root in a bucket of cold water. While distillation is more effective in extracting essential oils for human use, cold water extraction is sufficient for the garden. Leave the burdock to soak or macerate for three days. Strain the liquid and save as concentrate. Dilute it before spraying it on leaves or for daily watering. Add full strength in a circle around the plant as a supplemental pickup.